Planning your next phase of growth for your ecommerce business? Wouldn’t it be helpful to hear from ecommerce business leaders who have been where you are trying to go? What have they found to be the most helpful in growing their business and attracting new customers? 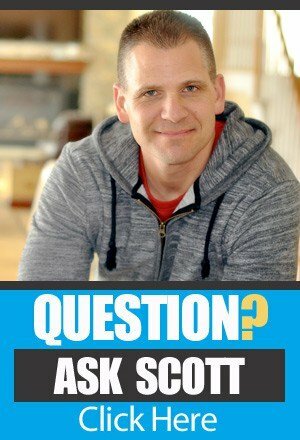 On this episode of The Amazing Seller, Scott welcomes back Jason Bear to give an update on his seven figure ecommerce business and the strategies he’s used to increase profits. Make sure you take the time to sit down and listen to this episode with pen and paper ready, you are going to need it! Are Lightning Deals Worth it? You’ve heard about Amazon’s Lightning Deals – but the question remains, are they worth it to you as a seller? On the one hand, they provide great exposure for your product listing and brand but on the other, it may not be the best time for your business given the phase of growth you are in. How do you navigate the best route? On this episode of The Amazing Seller, you’ll hear from Jason Bear as he opens up about his experience with Lightning Deals. If you haven’t considered Lightning Deals yet, this is an episode you want to listen to and even come back to as a helpful resource! Do you have an endgame in mind if your product does not prove to be as profitable as you had hoped? You’ve got to have a way to cut your losses and recoup some of your funds. On this episode of The Amazing Seller, you’ll hear from Jason Bear as he goes over how he was able to liquidate products that didn’t sell as successful as he had hoped. Don’t miss out on Jason’s helpful insights – it could be just the information you need to take your business to the next level. Find out more from Jason on this episode! If you’ve been around the TAS community for very long then you’ve heard all about the many reasons why you should have an email list for your brand. But how do you make sure you are getting the most out of your email list? On this episode of The Amazing Seller, Jason Bear explains how leaders like you can leverage your email list not only for product sales but to also plan ahead for future campaigns. Jason’s strategy is a great example of thinking outside of the box and using common tools in new ways. Don’t miss this fascinating episode full of helpful lessons from Jason, Scott, and Chris! Are you using Facebook Live? What if you had access to a free tool that could help promote and build your brand exponentially? Can you imagine what that would do for your business and its growth potential? On this episode of The Amazing Seller, you’ll hear from business leader Jason Bear as he walks through how he has been able to leverage Facebook Live videos to promote his brand and create a following. Learn how you can use this helpful tool to make your brand stand out from your competitors! 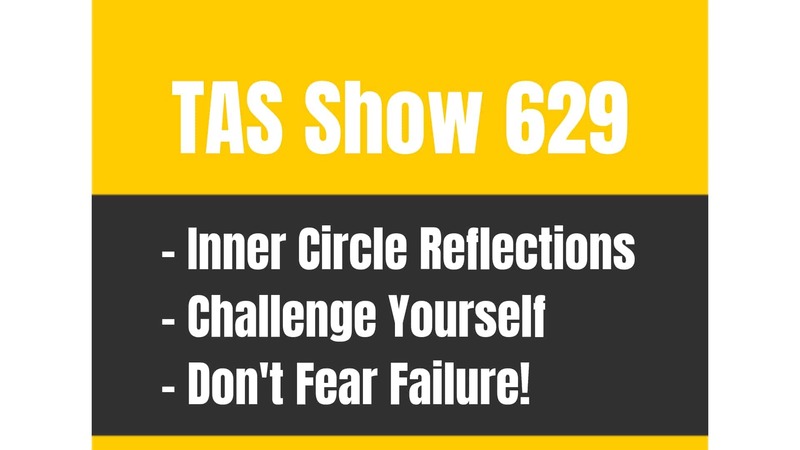 Don’t miss this valuable episode to hear more! [3:00] Jason Bear and Chris join the podcast. [4:30] Jason gives an update on how his brand performed on Prime Day and after. [6:00] Are lightning deals worth it? [9:30] Jason talks about how he’s dealt with product liquidation. [13:30] Post Prime Day sales growth. [16:00] Ramping up sales after running out of stock. [18:00] Crafting effective emails to your client base. [24:00] Jason talks about building an email list for future campaigns. [33:30] How to use Facebook Live. [47:30] Dealing with hijackers and other issues while liquidating products. [55:00] Lessons to take away from Jason’s story. [59:30] Creating a quality team with clear goals. 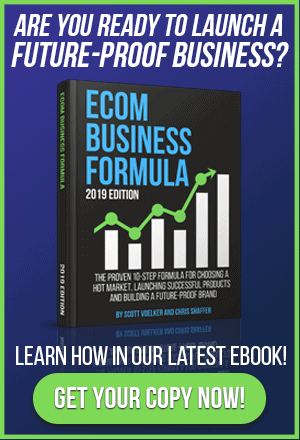 …with a seven figure brand with growth strategies, driving sales and ranking new products and this is since I had Jason on the show before who runs Fortune 500 brands on Amazon and in his own ecommerce as well. We had on episode 386, actually it was just Prime Day and now Prime Day is over and he has some results to share with us and also what they’ve done not even thinking about Prime Day but also doing a little bit of pre-planning for a certain season and then building a list for that season without selling them anything right now. It’s pretty cool to actually sit down with a seven figure brand and hear how they plan to grow because it’s very similar to what all of us are doing and it’s what we’ve been talking about here and he even talks about that. He’s like, “It’s always about the basic stuff and then we just do it at scale.” That’s what we are going to be talking about today. I’m super excited for you guys to be able to listen in on this and we’ll probably have to do another update because Jason is just awesome and he’s always willing to share and he always comes prepared. He always comes with this huge bullet point list of things that they are testing and tweaking and all that stuff and he is so willing to share and it’s so awesome that he’s sharing the podcast a lot of the episodes with people that are on his team to help them grow certain aspects of the business. Definitely do this for me. Go over to episode 386 if you have not listened to that, not now maybe after this and you can listen to all of that because it’s really, really solid stuff. I want you to think as far as what is one thing that you are hearing, whether it’s episode 386 or if it’s this one here 401 and pick one thing that you can do right now. [00:02:04] Scott: And actually Jason talks a lot about that as far as picking that one or two or three things that you can work on and then just really, really focus on those and put them into play and then you can see results. Now the only thing I’ll do is remind you really quickly is to download the show notes, transcripts, they can be found at theamazingseller.com/401. And I have to say, it feels a little strange saying episode 401 because we are over the 400 episode hump and if you guys have not listened to that episode I would definitely say go back and check that out. My daughter actually did the intro to that one which was pretty awesome and I got a lot of compliments on that. If you haven’t heard that one go check that out and I’m going to stop talking now guys so you guys can listen to this awesome interview that we did with Jason and you are going to learn about promotions and launching and list building and all of that stuff but we are going to break it down and we are going to dig into the nitty gritty. So sit back, relax and enjoy this episode with a seven figure brand. [00:03:04] Scott: Alright well I am super excited to have someone that we had on that did really, really well as far as listeners, a lot of downloads, a lot of people are interested in listening from this guy a seven figure brand that we talked about Fortune 500 company. Jason is back on to give us an update on episode 386. If you didn’t listen to that episode you definitely want to go back and listen to that one because it was really, really good and it was also setting things up for what we were going to be testing or Jason was going to be testing and then we were going to come back and revisit it and see how things work. Well, Jason is back so Jason welcome back to the podcast man, how are you doing? [00:03:42] Jason: I’m doing well. Thank you for having me it’s, good to be back. [00:03:44] Scott: Yeah this is exciting and I have this to say, every time that you do this, that you get things ready to come on the podcast you have this really detailed, and I’m jealous because you do a really good job of breaking things down and talking about things that you are testing and things that you are working on. You gave me this really in-depth bullet point list of what we are going to be talking about and there’s a lot. I want to dig in to number one, an update. Give us an update on Prime Day and the strategies that you put out there and tested. Give us just a recap really quickly. How did things go? [00:04:25] Jason: Yeah things went well, things went on very well for us we are about now at six weeks out of Prime Day and we are still digesting what happened there and really understanding what kind of lift we have but we actually had a sevenfold increase on that day for Prime Day for us which people were like, “Wow, how did you do that?” There’s a lot that we did to do it and sevenfold is a pretty big number but there are some cool things we did and I’ll dig into it if you want. [00:04:56] Scott: Yeah I definitely want you to. I guess first and foremost, a lot of people are probably listening and they are like, “This is a seven figure brand there is a lot that they are doing that is way beyond what I’m doing.” I want people to understand and you and I were talking before we got on here, all of these principles for the most part are things that you can do at a smaller scale just for you they were huge because you have a bigger customer list and email list but all of that stuff was done on a small scale and then scaled up. What I really want people to understand is like anything we are talking about right now understand you can take one of these things and apply it and then see what the results are. I think that’s what Jason is talking about, a lot of this stuff that you are doing is testing. You are not certain everything is going to work. I think there is one thing I want to dive into first, lightning deals because I see here you said it was just mediocre. Let’s talk about the lightning deal because Prime Day is a big day anyway without a lightning deal. You had a lightning deal or a few lightning deals. Talk about the lightning deal and what happened there and your thoughts. [00:06:02] Jason: Yeah so going into Prime Day week, we had two that were scheduled for Prime Day and then we had about five others for Prime Week and I was excited to see what’s going to happen on Prime Day. Amazon’s charging $500 for Prime Day thinking that our lightning deals are always pretty predictive in terms of the total volume we can have and which products that work and don’t work for us and there really was not much left for us on that Prime Day deal. That additional $500 did not really cover the cost of that offer. I know I’ve seen other people who sold thousands of units. I think that was a broader category but our products really did not pop on for our lightning deal which was a little disappointing but also you don’t want to have all your eggs in one basket and you have to play lots of different opportunities on Amazon. [00:07:00] Scott: Absolutely and I just realized too, I didn’t introduce Chris here on the show. Chris are you there? [00:07:06] Chris: I’m here too. I was just going to pop in and surprise people. [00:07:12] Scott: I was going to say I didn’t even know that you were there just because we tried to get you on and then we couldn’t get you on and then we finally got you on and then you were just so quiet so anyway welcome Chris. [00:07:22] Chris: I’m hated myself because I had the hiccups and I didn’t want to disturb Jason. [00:07:25] Scott: Did you want to talk anything about the lightning deal before we move on because I know a lot of people think, “Oh my gosh I’ve got a lightning deal. This is going to be amazing,” and I think Jason said it was kind of okay. [00:07:36] Chris: You and I get asked all the time. People are like, “Oh are lightning deals worth it?” We always throw out the answer that everybody loves to hate which is it depends. If it works for you, if your name is Nick Gamble then it always seems to work for him. Every time I’ve seen him post about a lightning deal he sells thousands of units and Jason he was one of those people on Prime Day… I mean he sold out of his inventory I think before midnight. It was a ridiculous thing and he had the same thing on last year on Black Friday, Cyber Monday but if you are not going to sell through it then it depends and like you said Jason you don’t want to have all your eggs in one basket and to me that’s an expensive basket. $500 is an expensive basket and for somebody at Jason’s scale it’s worth testing but Scott you and I got off at a lightning deal and it wasn’t even on Prime Day it was Prime Week and it was $300 and we cancelled it because we said, “Look we’d have to sell an extra two hundred units over and above what we are going to do anyway on that to make it more than a dollar on each one because of the price they wanted it for and the price of the lightning deal and for $50 or $100 a lot of times it’s worth it. For $300 and $500 you’ve really got to understand your margins and see, okay if I don’t sell the entire quantity which Jason that sounds like part of the issue that you ran into, if I don’t sell everything that’s here am I going to make money on this? Because you are paying $500 upfront and you are making a lower margin and that’s something a lot of people miss because they go, “Oh I got offered this lightning deal.” We get asked that all the time Scott and it’s something we actually avoided on Prime Day and Prime Week because we had that same exact thought and that same exact issue. [00:09:15] Scott: Well and we also didn’t have the inventory. We were going to run out of inventory so we knew, “Why are we going to do this if run out of inventory? It’s not going to benefit us.” So we just weren’t prepared really even to go full scale out. Let’s move on so lightning deals. And I see here Jason, I’m looking at your notes and you said here just like a little tip for the lightning deal I think it was here, or was that the liquidation tip that was your liquidation tip. Why don’t you talk a little bit about liquidation because I see you have a point there? [00:09:51] Jason: Yes one of our other big moves for Prime Day and I think it’s maybe why Amazon is doing it this time of year is it’s a good time to move through inventory. We took some our slow moving inventory, some of the inventory that we know wasn’t moving, we reduced the price almost 50% and the goal that we had was just move it out. We want to get through this inventory, our Q4 inventory is going to ready to get here. That’s what we should be focusing on and these long term storage fees that are coming up in august so get this inventory out before we incur any of those costs. So what we happened to do was once you start reducing the price, reducing the price to get it to a liquidation price to move sometimes the retail price of that product is too low to cover the FBA pick, pack and ship fees. If it’s $4, $6, whatever that is. So what we did and it worked for some of our products was that we bundled them together. We created a six pack of these items and said now we can show 85% discount or even a bigger discount and still be able to move through it and cover the cost of the pick, pack and ship fees. [00:11:04] Scott: Did you do a six pack though yourself and then ship that in as one SKU? [00:11:10] Jason: We did, we had the ability beforehand knowing that we had this inventory that we want to move through and we were able to bundle together create that bundled offer. We added it though as a variant to the original SKU. Right there was this one pack, now there’s an individual that had volumes. We had one, three and six pack. The six pack was the one that we put on a very big discount because we wanted to move through significant quantities. [00:11:33] Scott: I got you and okay anyone that’s even thinking about this. The days of shipping in all of your inventory and letting Amazon house it is over for a lot of us because you may not be able to sell through that inventory and you want to order enough to be able to have in stock and not run out of stock and not have to reorder every time and have it shipped over. So a lot of times now what people are doing including myself is you are just having a warehouse space and it can be just a storage unit. And then from there if you do have those pieces like you said Jason then you could create those packs yourself and then ship them in as a different SKU with a new UPC and FNSQ number so this way here is its own unit. But I like that idea because a lot of people say, “I have this stuff, what am I going to do now?” Let’s use an example that is obvious out there, fidget spinners. I get people all the time, “How am I going to sell through these?” Well you might want to do a six pack and just get rid of the things. It’s something like that that you can throw all into one bag and create a more I guess attractive six pack or four pack and then from there you can bundle them in together and make that discount seem bigger without having to do it individually. Okay cool, so that’s a cool little strategy though for the liquidation. Now I also see here that you were talking about… I mean you guys did a ton of stuff and you are saying after Prime Day you guys are still seeing a consistent 30% lift from this and I also see that you are saying that and I want to go into these deeper, but I’m also seeing that you did have a lot of external stuff traffic list all that stuff that you were also driving over there which is then going to help lift the Amazon algorithm and all that stuff and sales. Talk about that a little bit. [00:13:30] Jason: Yeah that’s really the secret of how we got our sevenfold increase on Prime Day. If we did nothing I would have said we probably would have got 30% lift and we saw that with our sponsored product campaigns. We saw about 30% lift but the reality is we drove a lot of the traffic to Amazon and really co-promoted that, “Hey it’s Prime Day it’s a cool event come shop now, come jump on that hype.” So that’s really how we got our sevenfold increase and the first big one was the email list that we’ve been building the past year. We have our customers who’ve been getting emails from giveaways, from click through to get an offer to send them an email with an offer in it so we have an email house file that we’ve built of these customers who’ve ordered from us previously to be able to market to them, to be able to tell them, “Hey its Prime Day come shop our sale. You have exclusive offer here,” maybe using sometimes a promo code to shop exclusively offer on our product pages or our store front that we actually had going. [00:14:34] Scott: Okay yes. I think people would think to themselves, “Man Jason you have this big house list why wouldn’t you just drive them to your own ecommerce store and not pay Amazon?” But you understand that pushing that product through Amazon and getting those sales they are going to then want to push you more because you are starting to get sales and they know that people are buying it so they are going to want to give you a little bit of ranking love in a sense and start letting you be seen with frequently bought together and this that and the other thing and you understand that. So you are willing to take I call it a loss in a sense because you could have saved that money in-house if you didn’t use the pick and pack but you know that that’s part of your advertising budget if you will. Is that correct? [00:15:18] Jason: Exactly and that’s where I can tell you the next six weeks or so we’ve had a 30% lift doing nothing. We had a good conversion rate that day because we drove hard traffic to there, they saw an increase in sales and now we probably moved ahead in the specific categories and products ahead of our competitors, if they didn’t do anything those days. [00:15:40] Scott: Yeah I love that and let me ask you this though because there’s people including ourselves and we are in a situation right now we blew out of about 1,500 units really quickly and so now we are out of stock and we are supposed to get stock I think in three days Chris, four days something like that, so we are going to be back in stock. What’s your strategy generally when you get back in stock and you want to ramp things up again? What is your strategy at your level and at your scale? What do you guys do to get the ball rolling again? When we sell out of products and we do have quite a lot of products, we probably have over 800 of that, we actually have been turning them off so the onesie twosies that come back in and we have size ranges so it could be a bad experience from the customer that reduces that conversion rate significantly on that page. We actually have been turning products off on Amazon and say, “Now the product’s back we are ready to go turn it back on,” and it gets the juice obviously it had before but it didn’t have this low period of one was in stock now it’s gone and it was on, it was off, it was on it was of that type of thing. It’s working pretty well, that’s for our overall account to have higher conversion rates which we think help as well. [00:17:28] Scott: Okay that’s great advice. Moving down the list here and I’m bouncing around here a little bit. You have here, email list and you talk about how you mailed your customer file that you’ve been building for over a year and then you said here number one, email number one was pretty broad in talking about Prime Day and your shop and the sale it was mediocre. You didn’t show a sale price and you showed just your product line. The second email you said was very specific to four products, you talked specifically about Prime Day deals and you gave an exact price of the product and then you said that sold very well. Can you speak to that? [00:18:15] Jason: Yeah I think when people are opening emails I feel they want to know exactly what the product is, exactly what the price point is to qualify them so when they are clicking through they know what they are getting. I think the one email we sent to them was too broad it was shop Amazon, Amazon Prime, celebrate with us type of thing and the click through wasn’t that high and then when they got to our store front page it was like, “Here is the whole bunch of stuff I don’t know what I’m supposed to be looking at.” But when you target them on this specific product is on sale, here is a special offer with the exact price point that you are going to be paying, got it I want it, click through and buy. I think there’s some prequalifying we did before that to get the quality traffic to it but the customer knew exactly what they were looking at and can say yes or no much more quickly than doing that browse and probably getting lost on Prime day other places. [00:19:12] Scott: Yeah that’s a good point, I definitely agree. We’ve been doing that too pretty much it’s like whether we want to stimulate sales over here then we are going to focus on that one product we are saying here is the entire product line. I’m interested to hear on this though because I know you were talking about… I want to talk about Facebook Click to Buy you have that here and I think that’s interesting. You spent like $5,000 and almost no sales you and you went on about this so I want to talk about that and how you can turn that around but I want to hear how did it work when you said that you were going to run Facebook ads to your category pages or just your product line page? It’s like your storefront on Amazon and then from there they would go and select the products so this way here we didn’t hurt the conversions on the listing and I thought that was pretty interesting. Did you end up doing that and how did that work? [00:20:10] Jason: We had two different campaigns that worked. It was similar to that email campaign. The broader one we had, which was basically shoppers, our storefront. See Amazon Prime Day, came to storefront page and we got traffic to it but then it wasn’t converting, they weren’t moving forward. But then we were again very specific about the very specific product line going to what we really did was a search results page which had our brand name and two or three keywords that were very specific to those products we were showing them in the Facebook ad. The Facebook ad had much higher click through rate but then when they hit that page they were much more likely to convert so that definitely helped. Then in both cases we really protected the product pages for the quality traffic that really we were looking to convert. [00:21:01] Scott: Okay so just people can get a visual on that so basically you had a Facebook ad that was targeting… Now I see here you were targeting your email list and then a lookalike so where you are taking your email list uploading it into Facebook and then creating a lookalike list? [00:21:14] Scott: And then from there you were then putting an offer in front of them that you felt would grab their attention and then from there you were directing them to your storefront page or your product page on Amazon and then from there they can decide what they wanted. I just want to give people like they can actually see it in their mind because we are doing an audio version here. Okay and you say here that you spent $5,000 and almost no sales and you said you can get burned but if you are offer very specific product with price point like two in one in return you guys did okay with doing that versus doing something that was more broad. I think that’s what you are saying. [00:22:01] Jason: Yes you got it. [00:22:03] Scott: Okay cool. So Chris is there anything you want to talk about that before we move in to Facebook giveaway and email collection because I think that’s going to be an interesting topic? [00:22:09] Chris: Yeah I think there is an overarching lesson here to be learned. One, Jason I think that it’s really cool you guys aren’t afraid… You and I have had this conversation before, that you guys aren’t afraid to mail your house file to Amazon. Now for those of you guys who listen to the podcast we talk mostly about Amazon here but Jason you were an ecommerce first business, you have a full ecommerce site and you are still driving traffic to Amazon. But when you said, “Hey I want you to buy this one,” they go buy and people always say that they hate being told what to do but people love being told what to do and you’ll see the same thing if you guys test this for yourselves. At any time that you can call out a specific offer, a specific product and drive people to that you will generally see that perform better. You’ll get a lower click through rate because people will say, “Well I don’t want that one,” but you’ll generally get a better conversion rate and higher sales overall. Does that make sense? [00:23:29] Scott: Yeah that’s perfect. [00:23:36] Chris: I want your people to click if they are not going to buy. [00:23:39] Scott: Yeah I love that. Okay, let’s move on because I love where we are going now. We are going to go into Facebook giveaway/email collection and I love this Jason because you guys are almost pre-planning for the season when you are going to be emailing these people. So in a sense, you are collecting emails today to email them in the season you know what I mean? So I love this and I want you to go really deep into this because this is interesting and I think from what I’m reading here, fifty cents per email but your whole goal here was to do something fun as far as a giveaway to celebrate Prime Day but really only collect email addresses and not so much the sale. Can you talk about that? [00:24:25] Jason: Yeah so one of our product category lines is a very seasonal product. I’m going to throw example of gingerbread houses. When do people want to buy gingerbread houses? It’s for Christmas season but I have an audience that I can target who will be in the market for that. We sold them that type of product last year and we built lookalike campaigns off of that so I know who to go target and these people aren’t getting targeted as aggressively in July. So the ad spend out there or the impressions that cost per thousand to advertise them is very low, like it’s off season for them it’s a group that isn’t in season right now buying. If I talked to them to go buy that product today they are going to be like, “Why would I want to buy that today? I have no urge to buy it now but it’s an interesting concept I like it, I like the idea, I want to be informed more about it.” So what we did basically was did a giveaway a contest that was over the top item to basically think of Christmas in July type of celebration that related to the products we were selling in Christmas to make sure it was definitely the relevant market to this customer base and all our goal was to collect the email addresses. And we could get a very cheap click through because it wasn’t competitive marketplace right now and it was for a contest giveaway of this product that was a similar product and all our goal was to collect the email addresses and basically literally send them a thank you and send them a thank you email to see who is open, see who has some engagement there but I wasn’t going to market them, I wasn’t going to try and sell them a product now. It was basically now I have these names I know when I’m getting in season when it’s September and October and it’s getting closer to their buying time I can now go market to them and I already have this connection with them and I have this email list and names so when I want to launch my product, when it’s the right time to launch it, boom I have a pool of names to now go target. [00:26:46] Chris: What are you doing between now and then? [00:26:50] Scott: Yeah there you go Chris. We think alike. [00:26:55] Scott: I beat you to it. So what do you do in the meantime? The list is going cold. How do we keep them warm or don’t you care you just warm them with some content when you start getting ready to get them primed up ready to go? Is that your mindset or do you try to keep them engaged up until that point? [00:27:15] Jason: We are going to do a few sneak peeks or ‘coming soon’ or some added content about the category of what we are talking about but we are not trying to sell them. Our product isn’t out yet, we know the commercial rate is going to be low and then it’s few and far in between say between now and three months we want to really hit them up with this the sale. We’ll probably email them once or twice a month with some content. But it’s hard, we spend the money to acquire these names and you are holding on them but we got to know when to hit them up at the right time. [00:27:52] Scott: Yeah I agree and I think that’s one of those things that… And you are housing these lists eventually it’s going to cost you more money when you house these lists, if they are not producing then you’ve got to do a cleanse and stuff. When does the cleanse happen for you guys? Do you guys maybe send them a couple of emails before and see who is opening and then get rid of the people that aren’t opening or you just don’t care? [00:28:15] Jason: We’ll make sure that the list is meeting our thresholds of what open and click, deliverables and deliverability rates to make sure that it’s still a healthy list but we’ll hit them pretty aggressively through the season. And then maybe coming into the end of the season depending on what inventory have, another way to move through some inventory at the end of the season is be more aggressive with an offer with them and then after that season’s over we’ll then cleanse the list that we have. [00:28:45] Scott: Okay that makes sense, yeah it makes total sense. Chris anything you want to add before we move onto another cool topic here which I see in all caps, huge, huge, huge success and that’s Facebook Live events? So I want to talk about that too, so Chris anything you want to talk about the email stuff? [00:29:02] Chris: Yeah I think that’s very interesting that you guys are doing that and Jason I’m curious to see what happens with that list. I know a lot of people and you and I have had this conversation in the past you guys are very conscious of all of those things. You don’t do anything and then forget about it. You do it very intentionally but a lot of people would forget about that small follow up and my general suggestion to people is at least twice a month, ideally once a week to follow up with those people. But if what you are doing is really holding them and there is nothing that you want to offer them other than a couple pieces of content and you know that, what is it middle of September maybe that you are going to start talking about gingerbread houses, then you can get away with it but you do want to keep that list warm because if you don’t send them anything between now and then it starts to get weird for people and then you see some of those decreases. So I’m glad to hear that you guys are doing a little bit of follow up there. It doesn’t surprise me at all knowing what you guys do. [00:29:57] Jason: And here is another just numbers of why it works is when we are in season, we pay up to $1.25 click, cost per click in Facebook. We got these clicks to this giveaway for 17 cents. We were blown away that we could get a click off of Facebook for 17 cents on that range. [00:30:15] Chris: 20% give or take. [00:30:20] Scott: And was that a video ad or was that just a regular image ad? What was the ad? [00:30:24] Jason: Regular image ad. [00:30:27] Scott: Okay, okay, cool that’s awesome but again you are forecasting, you are prepping and planning. So many people want to just drive traffic to a direct offer like right now and they just want to get the sale and I get emails all the time like, “Scott it’s not converting or I built the email list.” Here is another one I get a lot, “I built the email list, I emailed them once and I didn’t do that well with it and that’s it, done.” I’m like, “Well, number one you have to keep them warmed up and number two you can’t just email them once.” We always do some type of deadline so that we are there is a little bit of scarcity in that play. Do you guys add any deadlines like it’s going to expire or anything? [00:31:28] Chris: Note the languaging there guys that it’s an exclusive offer, it’s an introductory offer and it’s only for those people in this club or in this thing. It’s exclusive to you because you are important to us and that’s the language that makes and drives all that stuff. One you are giving them the deadline which is huge and I think it’s interesting Jason that you guys did send two Prime Day emails. Now were those back to back, were those split test or were those at different times to the same list? [00:31:55] Jason: They were different times to the same list. We actually did three during that thirty hour time period. [00:32:01] Chris: That’s exactly what we talk about. When you are doing anything in terms of a sale and we talk about this for product launches, you are going to send the first one and that’s going to let everybody know they are getting the product at a discount because they are important to us and it’s going to expire on Sunday. We then send a second email, “Hey guys just wanted to remind you that it’s still there” and then Sunday we are going to send one, “Hey, it’s expiring today,” and what you’ll see is you’ll see a big spike both the beginning and the end because you are letting people know about it both times. They know they are getting it because it’s important to them and they know that they are getting a deal and that they won’t get it if they don’t get it by Sunday. So it’s extremely important when you are doing something like that. But it’s awesome, I’m so glad that you are willing to share because this is really cool. Facebook Live, you weren’t even talking about Facebook Lives the last time that we talked and I see that you are pretty excited by the all caps that put in here. [00:33:34] Chris: HUGE, HUGE, SUCCESS. [00:33:36] Scott: Yeah and I just want you to walk us through Facebook Live and how you guys used it, what you did and how were the results. [00:33:46] Jason: Yeah so we’ve had a Facebook fan page for I’m going to probably say six years now. We are an established ecommerce brand and when everybody was jumping on the bandwagon of building a page and getting your fan base up we did that and we never could monetize it how much revenue could you generate back to your site from these people and then the organic post that you did stopped getting visibility and then everything became paid. Now with paid you can really measure that. So we’ve had this engaged Facebook audience that we can talk to that we’ve been talking to regularly who we’ve been providing content. They like us, they help us introduce new products, we talk to them in terms of shall we introduce going this direction and this direction or things that are engaging with our brand. We have a story to tell and people want to hear us. We have another product line that they just want the product. They don’t want to engage with us but this for one of our product lines, people are engaged and I think they pay attention to our fan page. So what we did was on this fan page we basically said, “Special announcement coming out on July 11th stay tuned, 10am join us on our Facebook Live event,” and we peppered them for probably about two weeks beforehand that we are doing something cool. [00:35:20] Scott: Now were you driving people there from your email list too? [00:35:22] Jason: We were not. We didn’t step into that yet. The answer is we will be definitely next time. [00:35:27] Scott: Okay just so people are clear and so I’m clear, you just basically had your Facebook fan page, you made all of these announcements and you are talking about the engagement is strictly on just the Facebook fan page whatever traffic you got from that you got from that? [00:35:43] Scott: Got you and how big is that fan page? [00:35:48] Jason: We have about 30,000. [00:36:10] Scott: Alright, cool. You made this announcement you are on Facebook, it’s just a fan page it’s not a group it’s just a fan page anybody can just like the fan page. So go ahead, now what happens? [00:36:34] Jason: Our Facebook Live event was with brand manager and our product development so the face of the brand who we want people to recognize as these people are connected to the brand. They are real people, they are making the real products, we want to make sure put the face to a brand and we started off opening our Facebook Live with, “Hey, thank you for joining us, here are some of the people we have, like and share this to try and get it out there, ” to create this buzz of, “Hey we are live, we have a cool announcement to make,” and before we really got to the announcement because it takes some time to get people to have your Facebook live get shared out, we did a couple giveaways. So we had this Facebook Live event going on, they could interact, talk to us, we were talking all about the product, all about the features of the product, why we are introducing it now, a little but why we are partnered with Amazon. But there was a clear call to action of ‘click here to get your offer’, ‘click here to celebrate with us to get additional 15% off this product’. [00:38:25] Scott: Now where was that link placed? Was that in the comment below or was that a URL that you guys redirected them to? Where were they clicking? [00:38:39] Chris: So it was in the body of the post. [00:38:40] Jason: It was in the body of the post correct. [00:38:43] Chris: Just something you guys may want to try Jason, also drop that URL in the first comment or comment and then pin it. [00:38:50] Jason: Yeah that is exactly how we did it and when people asked, “How do I click enter?” We did also added to comments. Somebody was following along and then we did pin it as well that was in Live. We were excited that people joined us. We had a hundred viewers basically on average during the time period we were on for 18 minutes. It ended 2,200 total views by the end so that’s pretty exciting there. The Facebook Live event was just eighty minutes long and lasted for two days of continuing to get comments and shares and likes and people were entering the contest for us for this product. So we were pretty excited that we created a video asset to use for an ad. [00:40:20] Scott: That’s awesome that you said that number one because I didn’t know that you were going to share a Facebook Live stuff before we got on and then I looked through the notes before and I’m like, “Oh wait a minute that’s right he was going to talk about Facebook Live.” This is a big nugget for anyone and some people be thinking to themselves, “How do I do a Facebook Live because I don’t really have a face?” This is where you can either find an influencer in your space that could do one for you or you would then try to add someone to your brand that could be the face of the brand and this can really be powerful. The other thing I want to add is that you took this… Now yours was more or less a time thing though so you can’t take that now and reuse it but with what happened, and I’m pretty sure you are probably already thinking along these lines but creating an asset right now that you can almost test. You are going to test something and then you are going to see how well it does live but you are also going to keep in the back of your mind, you probably want to have something that could be evergreen. So now what you can do is you can push that post after the fact and you can decide how well it did on the live and then you can put a few buck behind it and see how it does that way. The other cool thing that we found and this was totally by accident is we did a Facebook Live and it was really like demoing the product but then also showing different ways to use it and stuff. I don’t know if it was through there or email list but it got shared on a huge group, massive group and then we ended up selling though all of our inventory in like less than ten hours and we only had like 500 units so we sold through really fast. It also made us say, “Holy crap, when we get that product back in we probably want to put some ad spend behind that,” because it did really well into another group and that also can continue to bring in sales. And then the other thing that we found out is when we ran out of stock because we had a redirect link, we were able to then intercept the traffic and then push them to a landing page and start collecting emails for our wait list which I think is another important thing for people to understand as far as if you are doing anything like this. [00:42:26] Scott: Drive them to a link that you control. It can be a URL that you buy through Go Daddy and then you just redirect it or a pretty link or some type of redirect link plug in. Chris you want to add anything or Jason anything more on the Facebook Live stuff? [00:42:40] Chris: I think Facebook Live is huge and Jason you pointed out something that people might just glaze over and I want to highlight. You said you created a video asset, you created an ad basically but you are providing value so people don’t see it as an ad. Even when you do that as a boosted post, you are adding value there. It’s really difficult to add value or to showcase stuff in an ad especially the Facebook ad types. And Facebook Lives I think are incredible for that. One, video ads at least in my testing tend to outperform text or image based ads and Jason I don’t know if you guys have had the same experience with that but the video creation is the thing that always holds people up. Scott even us we tested a video ad in our first giveaway in the new brand and you and I were talking about it and I said, “Yeah we should probably create a video ad.” So we just created a GIF because didn’t have the time or the energy or the monetary resources to create a video. So we created a GIF but if you can jump on and do a Facebook Live talking about what you are doing to the giveaway you can then use that. It doesn’t have to be this really well produced video. It’s raw, it’s real and people really respond to that and I think that that’s huge. The other thing Scott that you pointed out is that you should always be using a link that you control. Do not link this straight to the Amazon page, do not link this straight to the checkout page. Have the link redirect and the reason for that is exactly what you just said Scott. We blew through a few hundred units in less than 24 hours and the only reason that we were able to salvage some of that additional traffic that continued to come, we doubled and tripled the number of people who saw that Facebook Live by doing nothing other than getting it shared in a larger group. [00:44:50] Chris: And going back to what Jason said earlier, when they stock back in on a product, they are trying to do a launch again. Well guess what, 100 people who have said that they are willing to buy the product day one when it’s in stock and you better believe that we are going to hit that list up as soon as we can. [00:45:03] Scott: And the crazy thing is though is we did our Facebook Live without it even being a discount and it got shared and we sold it at full price so it wasn’t even a discount involved. So again now you are starting to say to yourself, “Well maybe I should do a discount see what happens.” We didn’t even try it, it just happened which is pretty cool. [00:45:22] Chris: I think the other thing people need to keep in mind and Jason this is something that you’ll see is the more you do Facebook Lives, the faster they get traction because people start to see it, they start to click the notify me. So Jason I’m curious to see if you do like two or three of these in the future what happens in terms of your live concurrent viewers and your total viewers by the end because you should see that number start to sneak up because people get notified a little bit faster if they’ve interacted with the videos and stuff in the past. I’m curious to see what happens as you do those. [00:45:54] Scott: Yeah and Jason like now that that’s happened is that part of your strategy or you guys can be focusing a little bit more on Facebook fan page and Facebook Lives now? [00:46:05] Jason: Yeah Facebook Live definitely has some momentum there. We have already mapped out the next three that we are planning to do. So it’s exciting and we will be tapping our email list to tell them as added value here, “Hey, join us on our Facebook Live event,” so to try to get that traction out of the gates. [00:46:22] Scott: And the cool thing with that though and again a lot of people again going back to the email list you keep hearing go back to that but the cool thing is when people look at just the sale but now you are able to take those people, drive them over to a free piece of content that you are going to be doing live and they are going to be able to help you not by even buying it but by sharing it now and then that can blow everything up. So now that’s exciting stuff. I think that’s going to be good for you guys. Anything else you want to add on that or what else did you want to discuss before we wrap up? I know we’ve got like maybe another ten or twelve minutes before we wrap up and I know we’ve got a bunch more that we could cover. But what else did you want to go into or maybe some big takeaways that you wanted to leave people with? [00:47:34] Jason: I got a little story here of even a bigger brand who I would say has been successful on Amazon runs into some problems and had I little story here. We were trying to move through one of our products, liquidate one of our products and we had a lot of the inventory. We had thousands of units and we discount the product pretty aggressively and started seeing momentum, started seeing the sales and when you start getting attention and seeing this volume, other people are probably paying attention to you too probably looking around. And we had hijackers jump on our listings and we had to go figure out how to get them off our listings. We are brand registered, we went to the brand registry, filed a complaint. They ended up turning of our listing instead of their listing which caused even more problems. We had to escalate that, it took another twenty four hours or so for them to figure out the right listing but then we ran to this awkward problem and talking about liquidating product is I haven’t heard many people talking about this but there is a min/max field in Amazon. If you set your price too low it gives you these low inventory warnings and your product can get automatically shut off because Amazon’s actually thinking you actually priced it too low that there is an error going on. So we were running into problems with this min/max field in price setting that we had to adjust. We had a nightmare and the whole goal was just to move through this inventory. It was one problem after the next after the next after the next and sometimes you’ve just got to realize that you know what, it’s not going to work and figure how to take your loss before you get too invested and headaches of trying just to move through inventory. [00:49:30] Scott: That’s a good lesson learned but man that’s a painful one for sure and that’s interesting and I just wonder, we don’t know what that low price point is and until you get into a situation like this or do you have any insight on that Jason? [00:49:46] Jason: There is a metric in Amazon that says, if you price it six times lower than the max retail price, it’s going to potentially give you a warning. Then interestingly if you set that price in min/max field, there is another pretty vague statement in Amazon that says, “If you set those fields, Amazon has the ability to change the price as they see fit within that range,” which is mind boggling because I thought I could control the listing and the price. And you just actually by adjusting those fields you gave Amazon the ability to adjust your price so we didn’t know what was going on. [00:50:28] Chris: This is something that I’ve actually had a theory about for a while because there is also an issue where come in at a higher price point than your competitors that you don’t end up in the buy box on your own listing. I’ve seen it where if you come in two or three times above it’s FBA everything is set up correctly they just oh yeah, no and then when you lower your price down magically you are in the buy box. And if you lower it too low you lose the buy box. It’s like they are trying to figure out what the correct range is and if you come in and try to sell a garlic press for $1,000,000 it trips them up and they go a garlic press is not worth $1,000,000 dude, come on. There is something shady going on and the same thing probably happened to you Jason on the other side where they said, “Whoa normally this sells for $40 but they are selling it for $1.85, something is weird.” And they do that to try to protect you but it doesn’t necessarily always play in your favor. [00:51:27] Scott: Yeah that’s crazy and again you can sit here and say, “Well Jason’s got brands that are doing great and they have no problems. Everything is great, listen to everything that they are doing.” But there is those things too and there are struggles and it’s like I’ve said before, it doesn’t matter if you’ve just bought a franchise or if you started up a brick and mortar. You are going to have issues, it’s just these are part of the business of ecommerce or the problems of being in business in ecommerce and it just happens that Amazon is one of those channels. [00:52:38] Jason: I think sometimes you can get too comfortable with these products that are selling and that continue to sell but it’s always definitely very important to see how are you going to keep adapting, keep adjusting and what’s the next product or product within that space that really is going to be the next launching point to keep your momentum growing. Tools like Jungle Scout or tools like Scope that are out there that you should be paying attention to, what’s going on, who else is out there and feel comfortable that you are hitting your sales target today but what could potentially change with that. And part of that innovation too is always staying on top of what’s changing with Amazon and Amazon changes things so frequently. If it’s early review program they just introduced ‘headline search ads’, the new storefronts, how to get feedback, there is so many different things that you need to be figuring out. How do they apply to you and how are you going to stay with the competition in terms of the other sellers doing this stuff to stay with the game or ahead of the game to know what’s going on? [00:53:52] Scott: Those are some great points because again it’s always changing and you have to stay on those things and some things are really cool like headline search ads now. It’s like now we’ve got to play around with that and again we can probably dig into all those different topics that you have here which we’ll probably have to do on another episode but there is a lot of things that are changing. And there is a lot of things that you can do but you also said here focus on what you are good at and what’s working now and then keep that momentum and then grow that thing. We are talking about a lot of different things that you can do but it doesn’t have to be complicated and it doesn’t mean you have to do everything all at once. I want to leave people with this, I want them to understand like for you guys, like you would think this massive brand awareness and all of this stuff but when you launch a product on Amazon, it’s a new product. Go ahead. [00:54:52] Jason: It’s a new product and interestingly ten by ten by one. We are looking for that as well at an individual product level that looks like success for us. [00:55:04] Scott: Yeah so you are looking at the basics and from there the only thing that I see that you have a pretty good advantage… You have two things I think. Number one, you have an account that you are selling product through so you have an account that’s semi-seasoned. You have an account that has sales history all of that stuff which I’ve said in the past that that will over time as you build and you grow and you get sales consistently and you take care of your customers, you have feedback, all that stuff, your account gets a little bit better as far as when you are launch a product they may say, “You know what, they’ve been around a while, we are going to put them a little bit ahead of someone that’s just starting,” so that’s number one. Number two is you understand email list building and driving traffic to Amazon to spike the algorithm, to spike sales and to get the momentum started. That’s it, those are the two things that if people would understand everything else is just routine. If you have to do a listing you have to optimize like all that stuff is the roadmap. It’s like you just have to follow the blueprint but the other stuff going up there you guys start off with a brand new listing, never sold anything through that listing, you have to go ahead and fully optimize, pictures, all that stuff, backend all that, start your pay-per-click but then you have something that some people don’t have and that’s an email list to push sales. And now with Facebook Lives and stuff that’s going to be another little channel you guys can drive stuff through but would you say that that’s accurate? [00:56:55] Scott: Yeah you’ve got to almost go through all of those different channels or departments in a sense. You have to go through the procedures that the brand is set up which as you get bigger you have to start thinking about these things. And Jason I know you and your team take a look at everything and Scott this is what you and I do too, you take a look at everything and go, “Whoa, okay if everything else is equal we missed something somewhere.” And you have to have the ability to go back and reflect and see where you missed and I know Jason’s team is really good at that. You and I get a lot of emails a lot that they missed just that reflection. They say, “I did everything right upfront,” when we do hot seats and we get that all the time. “My listing is perfectly optimized.” “Well if it was perfectly optimized you’d be selling more so let’s take a minute and see if we missed it in the title, if we missed it in the description, if we are just not positioning the product right, if we are not talking about it correctly. We might think it’s a gingerbread house but it’s actually a gingerbread fortress. That’s the other lesson that I think people need to pull out of that. That’s that last missing step. If everything goes well then great but if it blows up in your face and you did everything right you have to have the ability to walk back through it step by step and see where it broke. [00:58:46] Scott: Yeah it’s like starting or having everything launched and going back and taking each step and going back and seeing where it didn’t work and then from there that’s something that you need to test to try to get that thing to work. So it’s like reversing the process in a sense and that’s huge for any business small or large. Alright let’s end with something I know that you want to definitely address because it’s a big deal for you because none of this could happen especially at the scale you are at without other people helping you. So why don’t you talk a little bit about a team and depending on if someone has a 1 person team or a 100 person team, what does a team mean to you and all of the different workings within that? [00:59:34] Jason: Yeah I think that’s definitely a key thing about how to grow and how to scale is making sure you identify that what your culture wants to be and how people can work together, what their skill sets are but really helping them identify what does success look like, what are goals, what are the objectives and write it down. We have a white board up there that we have what we call a curve, a daily curve that we are literally doing tick marks of did we hit today’s sales, did we hit today’s sales with overall sales or the new product launch? And we have clear goals and we celebrate when we do that so people want to be rewarded, they want to know what success looks like and definitely when you become a larger organization you might get lost in the minutiae about it’s a widget but it’s not just a widget it’s here’s all the moving parts and you’ve got to be invested in the overall goal. That’s definitely very important. [01:00:36] Scott: I think that’s huge and it’s funny because I just mentioned this the other day on another episode where I look at business as a game in a sense. So we have a team and I always relate it back to sports but it’s like if I have a football team and we get together, we are all going out there to win as a group, as a team. And we are going to run plays and some are going to work and some aren’t. We are going to back to the hurdle and we are going to talk about it or maybe the people that are up in the booth that are looking down that are seeing the defense doing something different we are going to adjust. And that’s team so you are going to celebrate together and you are also going to talk about the failures together and how you can then overcome those and I think it’s important for people to understand that everything that we are doing is like a test but we are also going after those goals in mind. Whether you are a one person team or just yourself, you can still create these short term goals, long term goals and then from there celebrate the wins and also then address the failures and then how do you pivot from that moment. But if you definitely, if you have people that are within your team, one person, two people, ten people, definitely have the same vision. And then also like you put here in your notes, reward them. Give them some type of incentive that if we hit something at a certain level they get something and it doesn’t have to necessarily be money. It could be like you get dinner out with your wife for the night or maybe a hotel and a dinner. There could be something like that that you can reward them and then from there everyone is happy and everybody is on the same team so I love it. Chris anything you want to end with the team stuff? I know we have our own little internal team that we do similar things and it’s like you just feel more part of the process. [01:02:25] Chris: We do and going back to your football analogy the one thing that a lot of people miss whether they are a solo entrepreneur or they are on a team, and Scott you and I are both guilty of this, is you don’t… The phrase that gets thrown around like in the Silicon Valley community and our buddy Joel is going to have a heart attack when he hears this but ‘you don’t know what you don’t know but you need to know what you don’t know’. If you are a quarterback, you are not a running-back. You are not designed to put your head down and run and if you get hurt that causes issues but you are really good at throwing maybe you have to scramble. You have to know what you are good at and if you are a solo person you don’t do the stuff that you are not good at. You find somebody that can do it for you. If you are terrible on video, maybe you don’t do Facebook Lives, maybe you find somebody to do that for you. You don’t have to do everything and that’s the thing that bogs a lot of people down. If you are by yourself it’s impossible to do everything and as you start to find people who can bring you up where you are weak, that’s when you start to build the team and that’s when you can expand that stuff. So you have to be honest with yourself, identify where you are weak and then see if you can find somebody that is strong in that area and Jason just having met some of the people on your team, I know that’s how you guys are built and I think that’s a big portion of the reason why you guys are so successful right now and you are going to continue to be. [01:03:41] Scott: Yeah that’s awesome. Jason man I want to thank you for taking time out of your day, I know you are a busy guy and like I said before, hopefully you’ll come back on again and share some of your insights and some of the things that you are working on. Any last little bits of advice for anyone that’s either starting or that’s moving through this Amazon/ecommerce space? [01:04:04] Jason: One step at a time. It takes time and reward yourself with a little successes. Look at the one day ahead and what you are going to get accomplished today and be proud of when you get accomplished. That’s important. [01:04:20] Scott: It is important and from a guy that ran 100 miles, something and other I don’t even know what it was. What did you run like 100 miles? [01:04:28] Jason: It was 100 mile triathlon in a desert event in Arizona. [01:04:32] Scott: Crazy so take it from a guy that’s run a hundred miles to take one step at a time or one stride at a time because this guy knows about taking one step at a time. I don’t know how you did it brother I really don’t but congratulations. [01:04:46] Chris: Well I’ll tell you how I did it. Do you want to know how I did it Scott? [01:04:48] Scott: How did you do it tell me? [01:04:49] Chris: One step at a time. 01:04:50] Scott: Oh yeah that’s right he did. Alright, well hey Jason thank you so much man and I look forward to hearing more. I know we’ll be in touch and keep me posted as usual and keep rocking man. It’s been a pleasure. [01:05:02] Jason: Thank you, thank you I will be back in touch with letting you know how our big seasons have come. [01:05:08] Scott: Chris thank you again too brother I appreciate it. [01:05:11] Chris: Absolutely anytime man. [01:05:14] Scott: Alright so I wasn’t kidding I mean we can go on for hours with Jason. He’s just so willing to share and just is an all round, great guy and funny. In fact and you guys heard me talk about that, the guy ran 100 miles, 100 miles in one race! Craziness and if you’ve never met him he’s just a small little guy. He’s really lightweight guy, thin… I mean you’ve got to be thin if you ran a hundred miles. Oh my gosh but anyway the guy knows what it takes as far as hard work and he knows what it takes in the business and just doing stuff like that and a lot of it is mindset. He’s got a great mindset, he’s just a smart guy too but I just want to thank him again and I want to thank all of you that have emailed me since the last episode which was episode 386 that I had him on or whether it’s on Facebook or Instagram and really just really just saying how much you enjoyed that deep dive. And I can also look at the numbers and a lot of you listened because I’ve got a ton of downloads from episode 386. And I think this one will probably be right up there with it as well and we’ll be having him back on. But again I just want to go back to pick one thing that you can focus on that you can either add to your business or just even during a launch. The one main thing that I know a lot of you have been asking questions about when we do Facebook Lives is the list building. I’m going to actually give you a resource here if you have not heard me talk about this. We did a free workshop, totally free and it shows exactly how you do, what Jason’s doing and what we are doing and it’s working really well. And that can be found at theamazingseller.com/buildlist. Alright so that’s it guys, that’s going to wrap it up, hopefully you guys got a ton from this. I’m going to remind you as always remember I’m here for you, I believe in you and I’m rooting for you but you have to, you have to… Come on say it with me, say it loud, say it proud, “Take Action!” Have an awesome amazing day and I’ll see you right back here on the next episode. 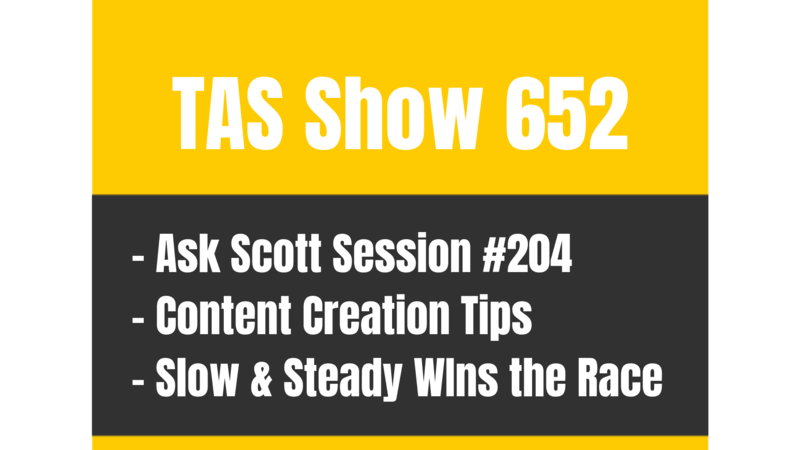 TAS 652: Ask Scott #204 – When and How To HIRE for Content Creation for TRAFFIC? Excellent podcast. Very very insightful. It is full of nuggets.